Working Preacher, commentary, podcast, app, etc., Luther Seminary, 2018. The Adventurous Lectionary, Pentecost 23, Bruce Epperly, Living a Holy Adventure, 2018. The Center for Excellence in Preaching, resources from Calvin Theological Seminary: Comments & Observations, Textual Points, illustration ideas. Lectionary at Lunch: MP3, Windows Media, and Real Audio files of lectures by professors at Concordia Seminary, St Louis, MO (LCMS). "The Law Prioritized and Relativized," D Mark Davis, raw translation and exegesis/questions, Left Behind and Loving It, 2012. The Lectionary Lab, Proper 26B, the Rev'ds Dr. John Fairless and Delmer Chilton (aka "Two Bubbas and a Bible"), 2012. Social Justice Lectionary, Dr. Bruce Sweet. Jesus Now, Proper 26B. Lectionary, study and worship resources from Faith Futures Jesus Then & Now. Rumors, for November 1, 2009, Ralph Milton, "Sermon helps for preachers with a sense of humor." "For All the Saints," Karoline Lewis, Dear Working Preacher, 2018. "When Jesus Weeps," Debie Thomas, Journey with Jesus, 2018. "Grandmother," Lynn Miller, Art & Faith Matters, celebrating our creative and living God by generating art and architecture resources for congregations and individuals. Art and Faith Matters facebook page contains additional resources. A Plain Account Wesleyan Commentaries, 2018. "Saintly Activity," Karoline Lewis, WorkingPreacher, 2015. "The Politics of the Greatest Commandment," Amy Allen, Political Theology Today, 2015. "The Interpretation of Love," Andrew Prior, One Man's Web, 2015. "Love and Change," Katie Munnik, Presbyterian Record, 2015. "The First Commandment(s)," Stan Duncan, If You Lived Here You'd Be Home by Now, 2015. "Past, Present and Future," Eric Smith, LECTIO, 2015. "Telling the Story," John C. Holbert, Opening the Old Testament, 2015. "Commandments and the Kingdom," Bob Cornwall, Ponderings on a Faith Journey, 2015. "Living by Heart," Alyce M. McKenzie, Edgy Exegesis, 2012. "First Things First," Heather Carlson, Ekklesia Project, 2012. "Just Another Horse Race," Melissa Bane Sevier, Contemplative Viewfinder, 2012. "Not Far from the Kingdom," Peter Lockhart, A Different Heresy, 2012. "The Power of Devotion," John Holbert, Opening the Old Testament, 2012. "Love," Frederick Buechner Sermon Illustrations. "Wherever You Go," Weekly Seeds, UCC. "Ruth: Resident Alien with a Face," study guide, Robert B. Kruschwitz, (other resources at) "Immigration," Christian Reflection, The Center for Christian Ethics at Baylor University, 2008. Mustard Seeds, "Choosing to Love/Feeling Like an Alien," Proper 26, 2015. A lectionary-based ideas resource for leaders of contemporary worship, Ann Scull, Gippsland, Australia. Worship and Liturgy Resources, Ordinary 31, by Rev David Beswick, Uniting Church in Australia. Lector's Notes, Ordinary 31, Gregory Warnusz, Saint Jerome Parish, Bellefontaine Neighbors, MO. Notes and commentary for those reading this week's lectionary texts to the congregation. The Timeless Psalms: Psalm 146, Joan Stott, prayers and meditations based on lectionary Psalms, 2015. Commentary on collect for Proper 26, Bosco Peters, 2015. HermanoLeón Clipart, Ordinary 31B. Free clipart, backgrounds, slides, etc. 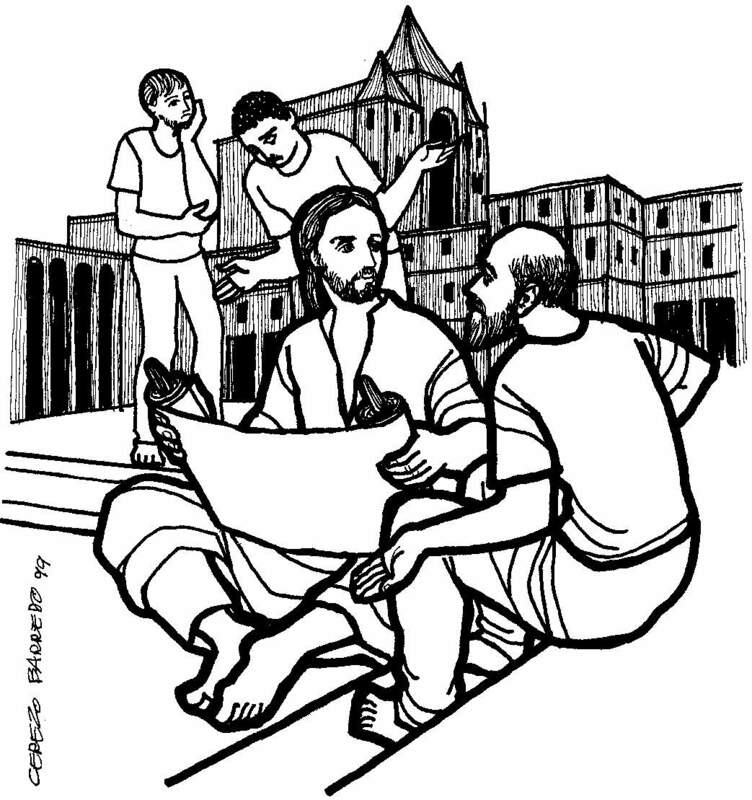 Clip Art Images: Mark 12:28-34, Misioneros Del Sagrado Corazón en el Perú. Ordinary 31 at Cerezo Barredo's weekly gospel illustration. Follows Latin American Roman Catholic gospel reading, though most gospels texts/themes are found in the index. Liberation emphasis. "Love God, Love Neighbor," Faith Element Discipleship System, "Setting the Bible Free," 2012. “When Waters Roar and Foam,” Carolyn Winfrey Gillette, is a hymn inspired by Jesus’ teaching to love our neighbors and to support relief efforts after Hurricane Sandy 2012, Tune: LEONI 6.6.8.4 (“The God of Abraham Praise”)." Abraham Journeyed to a New Country, Carolyn Winfrey Gillette, BUNESSAN 5.5.5.4 D (?Morning Has Broken? ), A hymn for the church's ministry with immigrants. Hymns of the Spirit Three, Proper 26B, Richard E. Hurst, Universalist National Memorial Church. Psalm Settings by Dale A. Schoening, Metrical Psalms: Psalm 146 set to St Thomas (SM 66 86), Psalm 119:1-8 set to He Leadeth me (LMD). Hymn and Song Suggestions, Proper 26B, 2015, annotated suggestions from Natalie Sims, Singing from the Lectionary. You Call That Church Music? alternative music planning blog for church musicians following the RCL (with videos), Ann Strickland, 2012. Shepherd Sounds, Sunday after All Saints. Background information for hymns and choral music following the lectionary from the Episcopal Church of the Good Shepherd, Austin, Texas, by Eric Mellenbruch and David Zersen. Hymn and Song Suggestions, Pentecost 22, 2009, annotated suggestions from Natalie Sims, Singing from the Lectionary. Choral Anthem Project, Ordinary 31B, National Association of Pastoral Musicians. Sing for Joy, Lectionary 31, 2009. Choral reflections on this week's lectionary readings, St. Olaf College. Worshiping with Children, Proper 26B, Including children in the congregation's worship, using the Revised Common Lectionary, Carolyn C. Brown, 2012. "The Most Important Part," Children's Sermon from Sermons4kids.com.